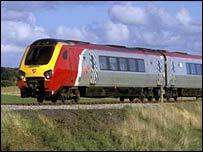 Virgin Trains has failed in its attempt to continue operating the Cross Country rail franchise, with rival Arriva winning the battle for the network. Arriva will take over in November, with the contract scheduled to last until April 2016. The franchise covers 1,600 miles, running from Aberdeen in Scotland to Penzance in south-west England. The new Cross Country deal will also include Nottingham-Cardiff and Birmingham-Stansted services. First Group and National Express had also pitched for the contract. Arriva shares soared by about 9% on the back of the news. The Sunderland-based firm, which already runs rail services in Wales as well as buses across the UK, will get a subsidy worth £1.05bn over the life of the franchise. Arriva has indicated that it may raise fares by about 3.5% above inflation, said the Department for Transport, which awarded the franchise. Among its other plans include increasing seating capacity by 35% on rush-hour trains on the main route by June 2009 and allowing passengers to print tickets at home. "The Cross Country network has many existing strengths but our research has helped us pinpoint important areas where we can improve the passenger experience and make the business more efficient," said Arriva's chief executive David Martin. Virgin's Cross Country franchise had been due to last until 2012, but the department had the right to terminate the contract and it decided to put it out to tender again. The firm said it was "extremely disappointed" at losing the franchise and would be seeking a meeting to find out why it was unsuccessful, saying its bid was "extremely competitive". "We attempted to strike a balance between an affordable and deliverable deal for the taxpayer, and continuing the high quality customer service that Virgin Cross Country has created," Virgin chief executive Tony Collins said.